due to illness, age, disability or transportation? and more right to your door! Who qualifies for the Home Delivery Program? The New Berlin Public Library provides home delivery of materials to patrons who are not able to visit the library in person. This service is provided for those cardholders with residency in New Berlin who are confined due to illness, age, disability or other qualifying circumstance. What Library materials are available and what is the cost?Materials available for delivery include all New Berlin Public Library materials with the exception of “new” items with a 7 day loan period. You may request specific titles or books by your favorite authors, subject to availability. Materials will be selected for you based on the reading interests you indicate on your application. By participating in the program, you agree to adhere to circulation policies as they relate to lost or damaged materials. 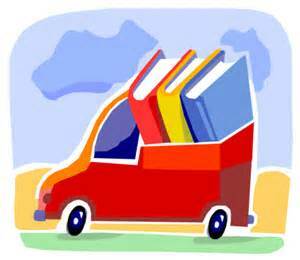 When are books delivered?Deliveries are made on one Tuesday morning of each month by our volunteer drivers. At the same time, volunteers will collect materials from last month to return to the library. You do not need to be present during the drop off, but materials must be in a secure location. How do I sign up?You may call the New Berlin Public Library at 262-785-4980 and our Home Delivery team of volunteers and staff will be available to help get you signed up! The application takes just a few minutes, or you may also download the form and submit it to the library. How do I get involved with the Home Delivery program?Home Delivery requires many volunteers to help for book selection, check out, and delivery. Please call us at 262-785-4980 if you are interested in helping with this service.